Not long ago, TCM ran a tribute to Clint Eastwood and it brought back memories of my experiences meeting and working with him. He was a very pleasant, down to earth man in person…a real pleasure. 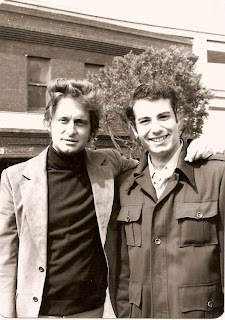 I met him first in 1971 when he was shooting Dirty Harry. I had gone down to North Beach (one of the film’s locations) to take a look at the “Harry” car which it was being arranged I would purchase from Warners' Transportation when the picture “wrapped”. It was to be my first car and owning a picture car driven by Clint Eastwood made it all the more exciting. ﻿ ﻿In 1973, three years after becoming an “extra” I reported on the set of Magnum Force - Dirty Harry’s second appearance on screen. 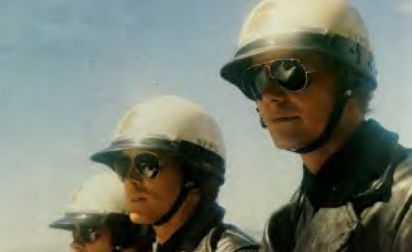 I initially performed in the background in various roles - police officers mainly, but during one of the days that I had reported to work as an “extra” I was approached by the Assistant Director, Al Silvani, who told me that my agent had suggested me for a small speaking role as a Cadet in the film. I was of course ecstatic. I was given the few pages of script that contained my line and rehearsed every variation of that piece of dialogue that you could imagine (see above and watch the very beginning of the clip below). Finally the day came and I reported to the police firing range to do my scene in the picture. I was in good company - getting to hang out with Robert Urich, David Soul, Tim Matheson, and Kip Niven all day (actually two days - it took that long to film!). They were a fun group…and I remember Urich doing impersonations of various celebrities like Ed Sullivan, etc. He kept us in stitches. Ted Post was the director and I was able to cinch my bit in two takes. Of course Clint Eastwood, Hal Holbrook, and John Mitchum were also there. It was a memorable event. ﻿The last time I got to work with Eastwood was in 1976 on his third outing as Harry in the The Enforcer. I was at the Hall of Justice - this time as an “extra”. Perhaps I was feeling shy - or maybe I figured he wouldn’t remember me because (after all) it had been three years since I last saw him - or I thought he was a big actor now and too busy for me - but in any case I felt uncomfortable to re-introduce myself and so didn’t bother to go up to him that day. However, as they were setting up I happened to glance over in his direction and he made a point to single me out and nod a greeting of acknowledgement. I thought that was pretty cool - especially since now he was a bonafide mega star! But, you know, in hindsight, I shouldn’t have been surprised - that is Clint Eastwood. He never saw himself as a “star” - he has always been unpretentious in that way. One incident to drive this point home occurred during the filming of Dirty Harry. My father worked in his usual capacity (liaison between SFPD and the motion picture company) on that film, and both he and Eastwood had the same birthday, May 31st. The crew decided to get a cake for my Dad and presented it to him at lunch. One problem - they forgot it was also Clint Eastwood’s birthday. Well, could you imagine what the results would have been if this happened to another big actor with a matching ego? Not Clint, he wished my father a “Happy Birthday” and enjoyed some of his cake. Well, that’s my two cents for what it's worth regarding my time spent with Clint Eastwood. Great memories of a great guy and certainly worthy of the honor TCM gave him. Of course, knowing him, he probably thought it was a lot of to-do about nothing. ﻿﻿Guest blogger Magic Lantern 21/aka/Tony Piazza is a San Francisco native whose father was at one time assigned by the City and County of San Francisco to be liaison between the SFPD and visiting film companies. This assignment involved assisting with scouting locations and making sure the city's day-to-day activities weren't hampered by filming. One such assignment was responsibility for the safety of citizens and property when the iconic chase scene in Bullitt (1968) was being filmed. Tony himself, as he mentioned, worked for a time in the industry. He was an extra, a stand-in, performed stunts and had bit parts in films and on TV. Eventually, however, his life took a scientific turn and he has had a long career as a biologist. 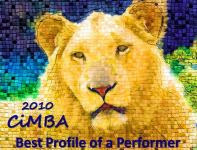 More recently Tony returned to entertainment and the arts. He performed as an extra in the film Sideways (2004), did a commercial for a local retail store and has produced his own films. His book, Anything Short of Murder, is about to be published by Dog Ear Publishing, hopefully by the end of the year; it will be available at Amazon and other major book sites. As MagicLantern21, a member of TCM's CFU, Tony has a long-running murder mystery serial, REEL MURDER, in progress. Click here for a link to the related contest he's created and the chance to win a $20 Movies Unlimited gift certificate. Michael Douglas with Tony Piazza (Magic Lantern 21) on the set of "The Streets of San Francisco"
Clint is phenomenal....great post you have here...I'm definitely a follower of your blog. Please stop by my site and follow my movie reviews as well...thanks! Magic, this was an immensely entertaining post! Your inside knowledge of the movies business and the people that work in it is always a delight. But the best part is seeing the photo of you with Michael Douglas! BTW, MAGNUM FORCE is my favorite of the DIRTY HARRY movies. dear TONY/MAGIC..thanx always for sharing your "life experiences"..an excellent insight into the industry and persona of CLINT EASTWOOD!!! Thank you Rick29 and doctor sabelotodo for commenting. The real joy for me is being able to share these memories with others. Thank you Magic/Tony for sharing your memories, and your father’s memories, working with Clint Eastwood and the film industry in San Francisco. 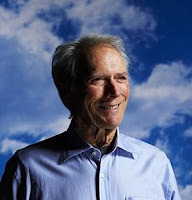 We all too often hear negative anecdotes regarding various stars, and it is really nice to hear that Clint Eastwood was gracious and kind to both you and your father. 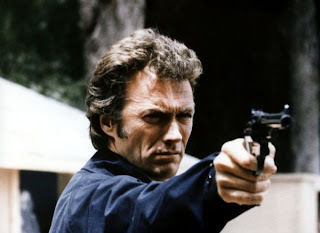 I confess that I have never seen one of the Dirty Harry series of films, but it is encouraging to learn that an actor who appeared on both the small and big screens was consistently humble (and even self-effacing). The behind the scenes insight is fascinating, knowing that it took two days to film this brief scene. I wonder if you were concerned that your speaking part might have been cut from the film? Having your scene cut from a film is always a possibility, and you do think about it. I had a bigger part on a "The Streets of San Francisco" episode called "Shield of Honor" (2nd season). It was there on the first and second run, but disappeared with a commercial filling the spot on re-runs thereafter. When the DVD was released I was happy to see that it was there again. Thanks for commenting. I'm happy to report that this post has been viewed by many - and from many countries. I have always enjoyed Tony's blogs on his movie/TV production experiences and it's gratifying that so many others do, too. Also great to see Tony in action...thank you, YouTube! Thanks, Tony and Eve, for a great post. For those of us not involved in making movies, it is very enjoyable to hear the little stuff that goes on. It probably doesn't seem like a big deal at the time, but those memories need to be recorded. Think of all the great silent films that have been completely lost. Then, bump it forward a few decades and you can see how important it is to document everything. Tony, your 15 minutes of fame just got a bit longer! Thank you so much for your comments. On the TCM website yesterday I received a question regarding the famous chase scene in the film "Bullitt." The author of the e-mail said that he had heard that the entire chase was filmed on an Easter Sunday in order to avoid crowds. I e-mailed him back and told him that that was incorrect. The scene was filmed over several days and definitely not on a holiday. My father worked on this production and I would have certainly remembered if he were not present with the family on that particular holiday. I went into more detail on that e-mail, but the point that I am trying to make in my usual long-winded fashion is that something of the truth can be lost or misconstrued when details are not garnered from firsthand witnesses. I have to thank TCM and especially The Lady Eve in this case for allowing me to tell my stories and keep the facts straight. What wonderful luck for you to be involved with your father's part in filming and to be able to appear in these movies yourself. It must have been a lot of fun. It's good to hear that Eastwood is just a regular nice guy. So often the only publicity we hear is about the stars who are prima donnas. I got to be an extra once, when I was 14 years old. The movie "Winning" with Paul Newman was partly filmed here in Indianapolis at the 500 race track. I was part of the crowd. I was paid $19, as I remember, a boxed lunch, and got the worst sunburn of my life! But it was worth it. I got to meet and shake hands with Paul Newman and Robert Wagner. At 14, that was quite a thrill. Thanks for a really interesting, first-hand perspective article! Thank you for reading and commenting. "Extra" work is not as easy as it sounds... a lot of long hours and yes...sunburn if outdoors. I was an elected member of S.E.G. for two terms (Screen Extras Guild)and believe me, we were always fighting for "extra's" rights. It was tough work... rain, shine, you name it! They earned every penny.